I've been thinking a lot about how I can continue to spread God's love through this here blog and create a stronger community of faith. You have all blessed me with your encouraging words, and in my own little way, I have tried to pray for you all. But what else can I be doing? How can I continue to help us grow together... even though we're miles apart? I would love it if you'd join me in praying for one another. Each Monday I would like to post our prayer requests so that throughout the week we can spend some time thinking about one another and building one another up. I think we do a great job commenting on our blogs and supporting each other in that way, but I for one believe there's so much more. If this isn't your thing, heck, I usually post again at noon so wait to read my blog until then. Or by all means, skip Monday's posts altogether. But if this is something you'd like to do, I'd love to have you along. 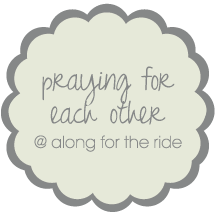 If you have a prayer request you'd like to share, please e-mail it to me at iamalongfortheride[@]gmail[.]com. I will list each prayer request on Monday along with your name and blog link. If you do not want your blog to be linked, please just let me know. cool idea, friend - love that verse too! I just started doing this on facebook. Love the blog idea as well! I love this idea Laura!! What a great way to connect with each other! Laura, you're so fantastic. What a sweet and nurturing spirit you have! Great idea. I am sending you an email! Ooh. I'm in. Email on it's way. Aww what a nice idea! I've been trying to pray more lately, so this sounds great! I'm not all that religious, but I am definitely in. Wonderful idea!